One August day back in 1987, I was spending part of the summer in a house with about 8 roommates. I knew everyone at acquaintance level, got along fine, rent was cheap. I was downstairs one sunny morning, washing dishes, thinking with excitement about my impending travel to France for a semester of study abroad. I would be leaving in just over a week! In a haze of daydreams about what wonderful new French adventures awaited me, I left my mother’s gold high school class ring next to the sink. I treasured the ring – Mom and I had graduated from the same small town high school exactly 30 years apart. I was in my bedroom for no more than a half hour when I realized the ring was not on my finger. I went back down to the sink and it was gone. I knocked on the door of the guy whose bedroom was right next to the kitchen – the only other person at the house in the middle of the weekday. No, he hadn’t seen it – I must have lost it somewhere else. There were rumors about the house that he had a cocaine habit, and that things of value tended to disappear when he was around. I told him how important the ring was to me, how it was my mother’s. I tried to give him the honorable way of returning it by asking him to help me find it. I even had another friend scour his room whenever he went to the bathroom. But to no avail. My roommates told me that my ring was probably in a local pawnshop, a casualty of his coke addiction. I weighed up visiting the local pawn shops in search of the ring. I had a vague idea that in the days after the theft, the ring would not yet be in a display case and that I would have to ask each pawn dealer about the ring. Would they even tell me if they had purchased it? Why would it be in their interests to do so? I imagined seedy places run by corrupt shopkeepers. With hundreds of tasks to complete before boarding the plane to Paris, I decided to give up on the ring, and that is the unfortunate end to the story. That stereotypical image of the pawnshop – as a place that fences stolen goods run by less-than-honest shopkeepers – remained with me. So when our home was burglarized last month, I asked the police officer who came to take the report whether I would most likely be able to find my stolen items in local pawn shops. “No,” he explained. Pawn shops need proof of ownership to accept goods, and the goods they purchase are all uploaded into a database for police to check whether they match the descriptions of stolen goods. Pawn shops were selling things on the up and up. 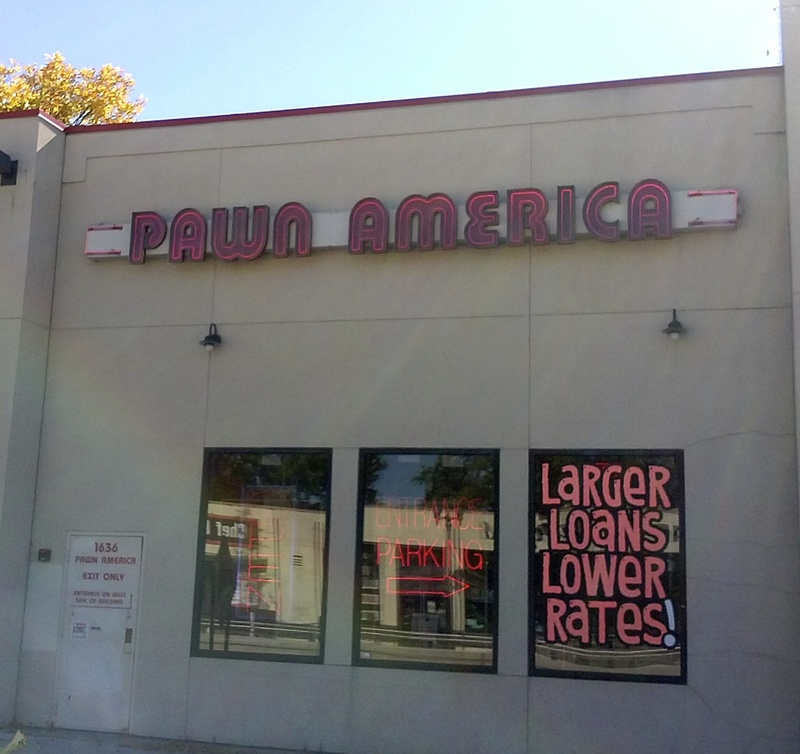 I later learned that in fact pawn shops have been improving their image and expanding their services to appeal to more customers. The police officer speculated that Craigslist was mostly likely the place to find my stolen goods – no requirement to list serial numbers, no way of verifying whether the person selling is the actual owner. In the days that followed, I thought about how in the past I had raised my eyebrows when someone had mentioned buying used bicycles at local pawnshops, but I never batted an eyelash over the years at similar stories of “great deals” found on Craiglist. Of course, stories of people finding their stolen goods on Craigslist abound – my favorite is the one about the girl who went to go “buy” her stolen bicycle that she saw posted on Craiglist. She asked to test ride it, and simply rode away. Payback (though this approach is not law-enforcement recommended)! I did a little internet research on how to try to spot stolen goods on Craiglist. According to this ABC News Story, “Is Your Stolen Stuff on Craiglist?” check Craiglist frequently in the days following a burglary. Watch for descriptions of items like those you lost being sold by one seller – very suspicious if the seller’s location is somewhat close to your home. If you suspect your items are being sold there, you can try expressing interest and request more photos to hopefully obtain confirmation that it is indeed your stolen bicycle, computer, etc. And then call law enforcement to follow up if it is likely that it is indeed your goods being sold (rather than risk potential violence in an angry confrontation with a thief). The ABC News Story also gives buyers some red flags to note in order to avoid purchasing stolen goods on Craiglist such as the use of stock photos rather than actual photos of the item in question, poor descriptions, and sellers who want to meet away from their residence (though, with that last one, I think a seller might want to protect themselves from a shady buyer by meeting in a public place). This made me think about other on-line sites where I buy secondhand goods, like e-bay or Amazon Marketplace. Do stolen goods also show up there? I even found a website that gives tips for selling stolen goods that recommends thieves use Craiglist and ebay (though warns to watch quantities on ebay). Amazon Marketplace is apparently less desirable for thieves because they ask for tax information from their sellers (they would have to report sales as income to Uncle Sam). Earlier this year, a Sacramento man was arrested as part of a shoplifting ring that had sold thousands of stolen items on ebay. I did some more poking around the internet on the warning signs for shady e-bay auctions. While not all on the lists seemed fishy to me (seller with multiple items, for example), some made sense, like: sellers with many NWT (New With Tags) items; the same seller with an item in different sizes and colors; a seller with products that match description of recently stolen goods located in the same area from which they were stolen; and auctions that do not use paypal (because paypal apparently makes it easy for investigators to follow the money). Now I can think of situations where there are innocent reasons for any of these red flags, so unfortunately, there is no sure way to tell. Personally, I primarily use e-bay to find vintage items, so I’m not going to lose sleep over whether I’ve inadvertently purchased stolen goods – I’d be shocked if there’s market for fencing stolen vintage sweaters. And even with newer items, most sellers provide ample photos and descriptions which suggest they are quite familiar with the objects they are selling. Are there any happy endings here? I do have a more favorable image of pawn shops. As for the burglary, we did not recover any of our stolen goods. However, if anyone reading this happened to have purchased a 1955 gold high school ring in the Twin Cities back in 1987, drop me a line. So far no luck on ebay.